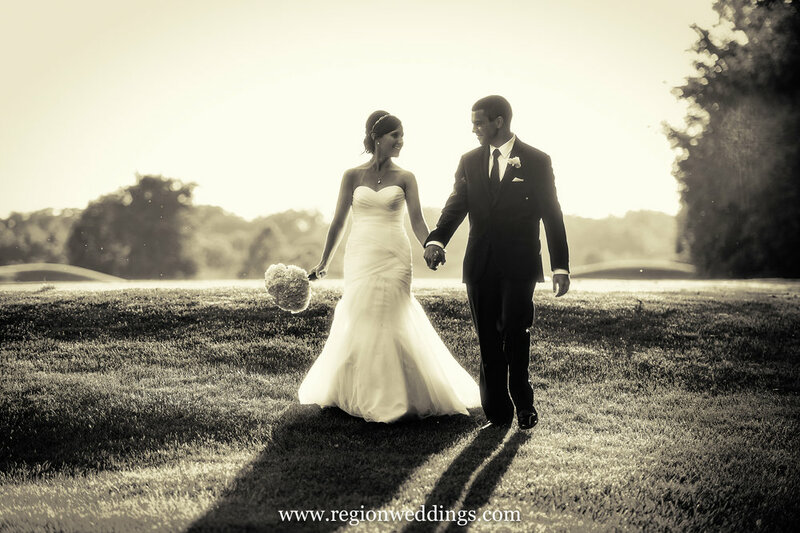 Bride and groom in silhouette at White Hawk Country Club. No churches - I love photographing inside churches, but these are more personal and not really "venues". No homes or backyard weddings, etc. - I love these intimate locations, but again - not a venue. No "photo locations" are listed such as local parks, lakes, etc. NOTE: If your favorite venue is not listed, it probably means I just didn't shoot there in the past year. With as many weddings as I photograph, chances are I've been there at some point and will be there again. When you schedule a meeting, just ask. A beautiful golf course venue in Crown Point surrounded by beautiful homes. The big draw is the lovely outdoor wedding area along with a spacious bridal suite, reception room with an outdoor deck and of course picturesque scenery for photos. 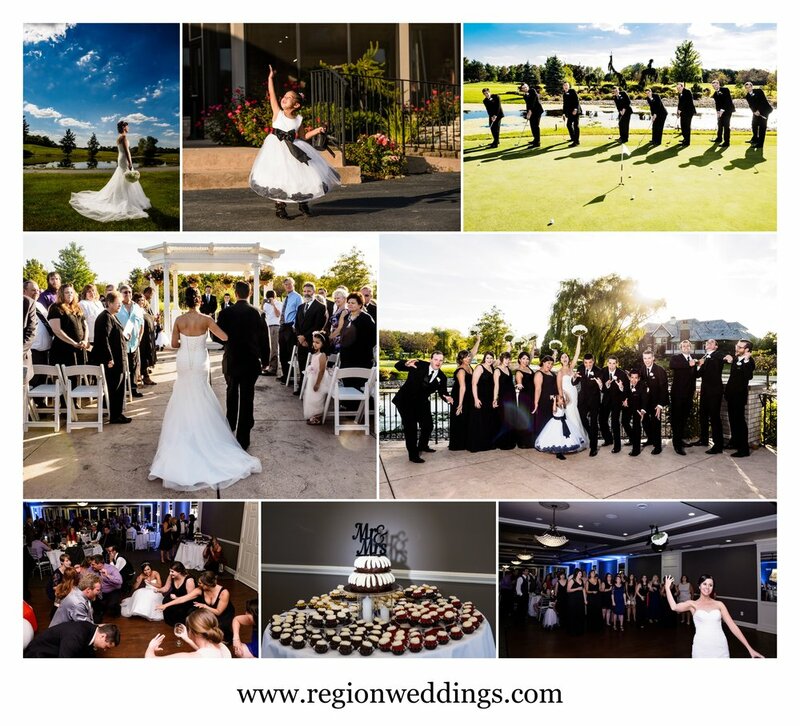 Weddings at White Hawk Country Club. Bride and groom strolling along the golf course at White Hawk Country Club. 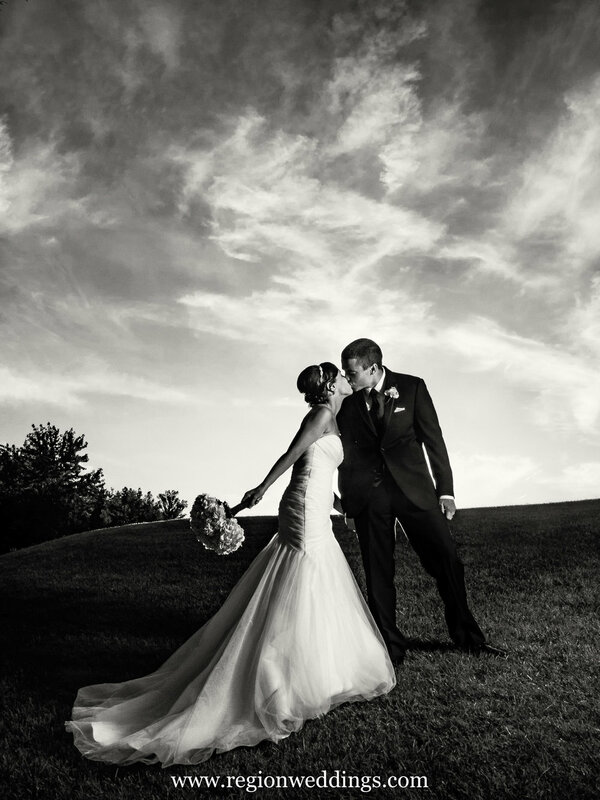 Black and white photo of bride and groom kissing on a hill at White Hawk Country Club. Speaking of spacious bridal suites, Sandy Pines in Demotte, Indiana has one that is simply phenomenal. You will want to live there!! Full kitchen, hair and make up stations, a man cave and much more. Oh, and a grand outdoor ceremony area and open air reception room. The bridal suite at The Pavilion At Sandy Pines. Wedding photos at The Pavilion At Sandy Pines in Demotte, Indiana. Wedding reception photos at Sandy Pines in Demotte, Indiana. I visited Wicker Park Social Center three times last year, so I know how popular this Munster, Indiana wedding venue is. There is a huge gazebo next to a lake for outdoor ceremonies as well as a wooded area for pictures and of course the magnificent ballroom with a deck. Newlyweds take a walk through Wicker Park in Munster, Indiana. Wedding photos from Wicker Park Social Center in Munster, Indiana. 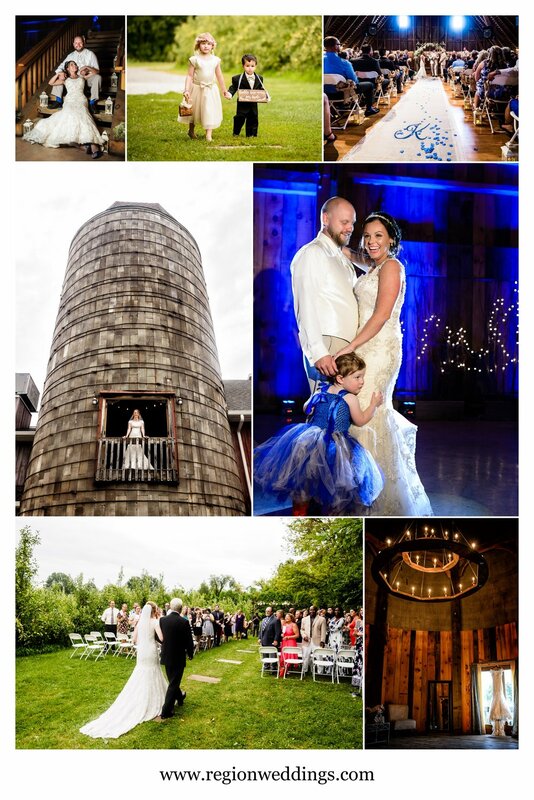 Barn weddings are quite popular and I photographed several of them last year. 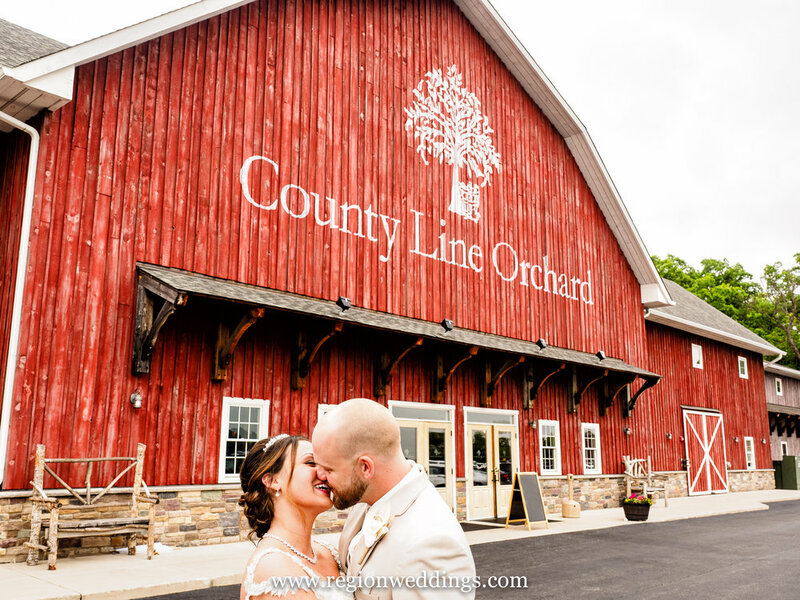 County Line Orchard in Hobart, Indiana is known for their rustic reception venue as well as their outdoor weddings in the apple orchards out back. You also have the option to have an indoor wedding in their red barn loft. The front entrance to County Line Orchard in Hobart, Indiana. Wedding photos at County Line Orchard. 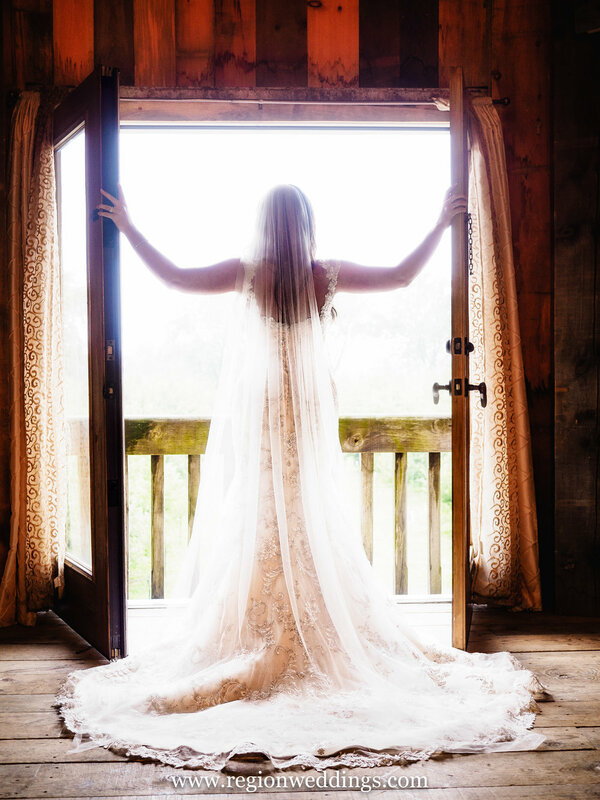 Bride opens the doors on the balcony of the bridal suite at County Line Orchard in Hobart, Indiana. 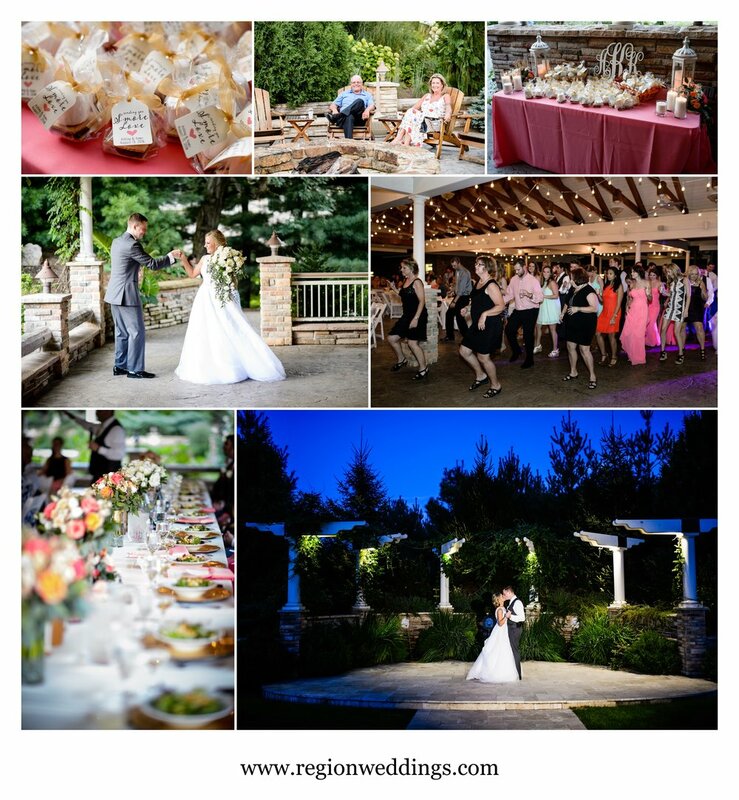 Aberdeen Manor in Valparaiso, Indiana is a spectacularly decorated reception venue (ask about the floating cake option) that also offers outdoor ceremonies as well as a chapel where you can bring your own officiant. Wedding photos from Aberdeen Manor in Valparaiso, Indiana. 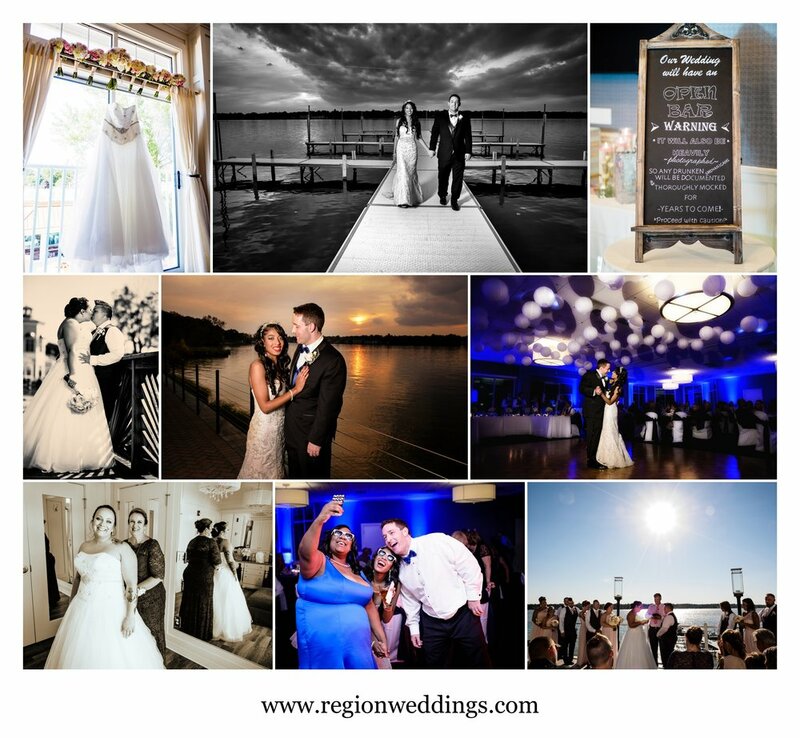 This wonderful restaurant in Cedar Lake, Indiana has a great upstairs reception room that overlooks the lake as well as outdoor ceremony locations and plenty of photo opportunities via the large pier and the sandy shoreline. There is also a bridal suite. Wedding photo on the pier at Lighthouse Restaurant. Wedding photos from Lighthouse Restaurant in Cedar Lake, Indiana. Sunset on the pier at Lighthouse Restaurant in Cedar Lake, Indiana. Signature Banquets is a fairly new hall in Lowell, Indiana that is gaining in popularity. The rooms are always super clean and the dinner biscuits are delicious (trust me - I've had a few). I've photographed an indoor ceremony here as well as a number of receptions now. Two thumbs up for sure! Wedding photos from Signature Banquets in Lowell, Indiana. This luxurious golf course venue is located in Dyer, Indiana. I've done receptions there in the past and the ballroom is exquisite. This past year I photographed an outdoor wedding there with a cocktail hour in the ballroom. The golf course is beautiful and a great backdrop for photos. 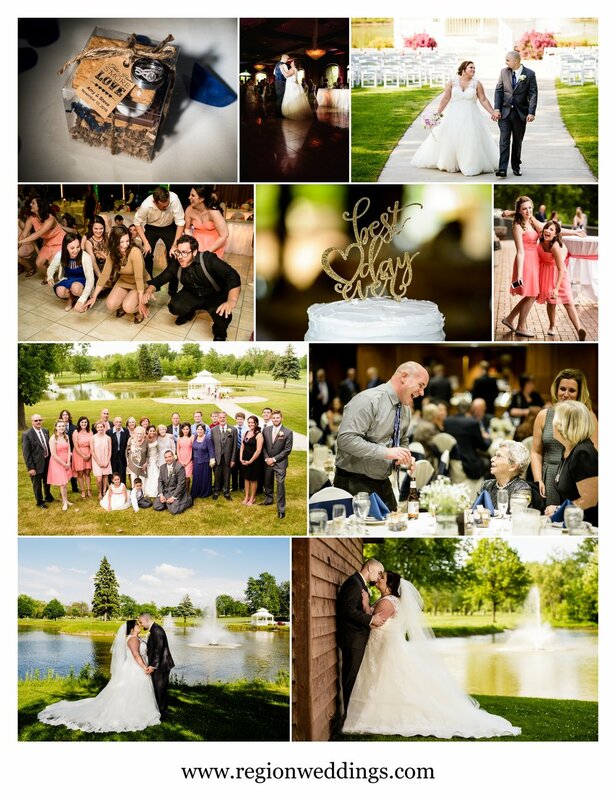 Wedding photos at Briar Ridge Country Club. 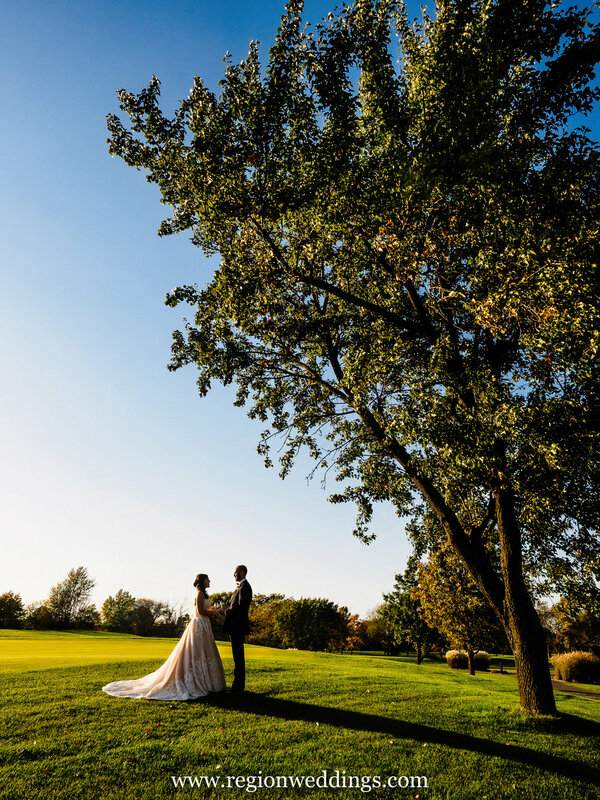 Bride and groom under a tree at Briar Ridge Country Club in Dyer, Indiana. The Center For The Performing Arts is located in Munster and features art exhibits, concerts and more. 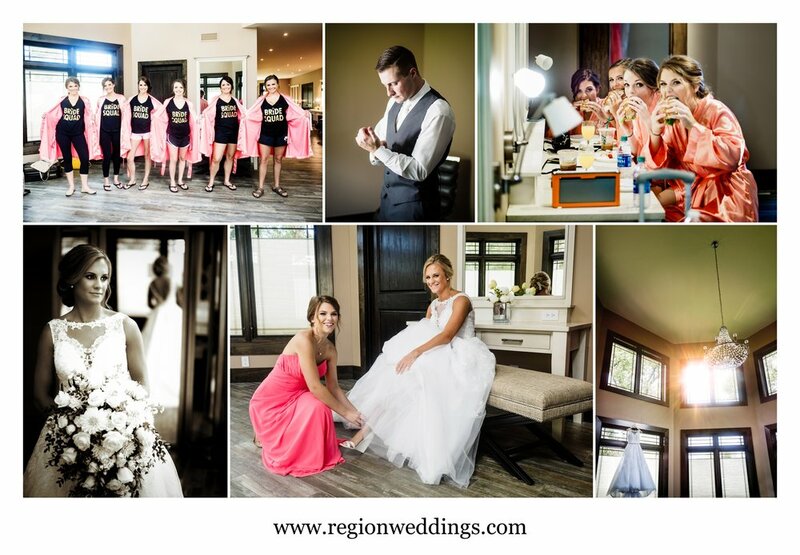 I've shot a number of weddings there over the years and got to go back in 2016 where I covered getting ready in the bridal suite and the super fun reception with a live band. Bridal suite at The Center for Performing Arts in Munster, Indiana. 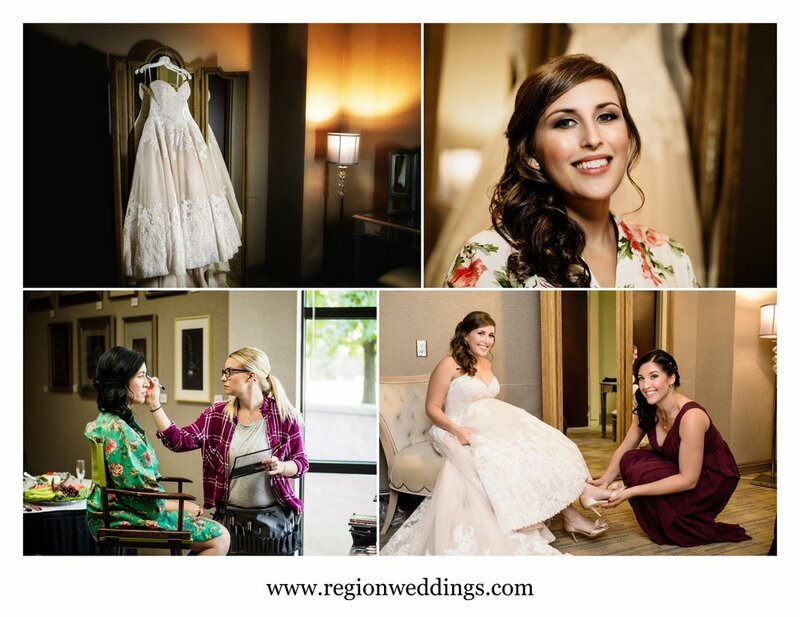 Wedding photos from The Center For The Performing Arts. I've run out of fingers and hands to count how many times I've shot weddings at The Patrician in Schererville, Indiana. They do a terrific job and can handle many events in the large ballrooms as well as outdoor ceremonies. Bride and groom outside of The Patrician in Schererville, Indiana. Wedding photos at The Patrician in Schererville, Indiana. Wedding photos from Centennial Park. The bride and groom are illuminated by sun on the bridge at Centennial Park in Munster, Indiana. In my 2016 Year In Review post you can see the many other locations my wedding photography clients took me to last year - churches, old barns, local parks, the beach, Chicago and more. Too much for one article, so follow that link and also scroll through this blog. 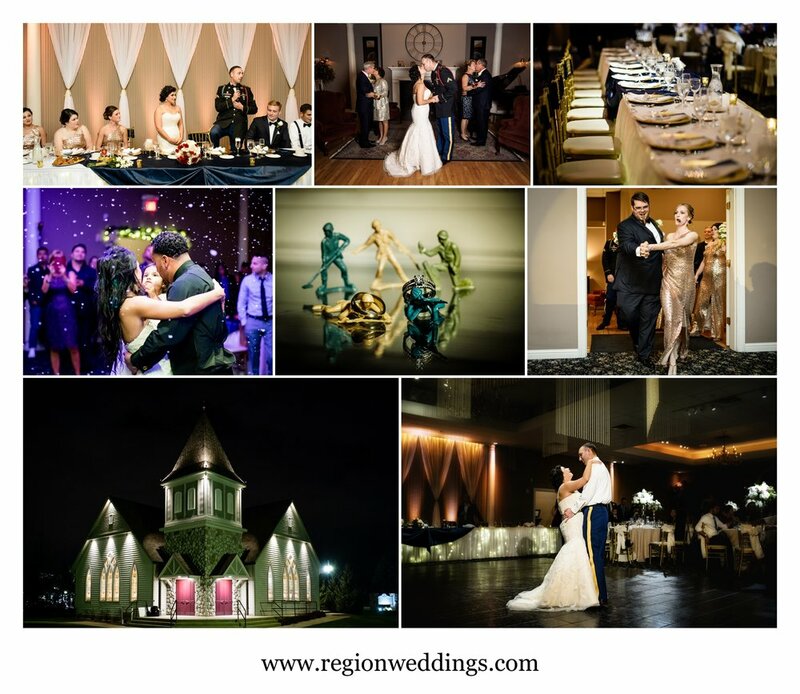 What other Top Wedding Venues In Northwest Indiana did I photograph at this year? We made stops at The Allure, Cloister in the Woods, Sand Creek Country Club, Meyers Castle, Trinity Hall, Villa Cesare and Avalon Manor. See the images below and happy planning!! Wedding photos in Northwest Indiana.